February 17th, 2010 by KTU | Filed under 4. Components and Systems, Park City Mountain Modern. Ice damming occurs on snow covered roofs when an upper surface of the roof is warm enough to melt snow and when the eave of the roof is cold enough to re-freeze the resulting flow of water. The accumulation of ice at the eave, both visible as icicles and below the snow near the edge, creates a dam that allows water from the melting to build up. If the water backs up far enough, it will flow through seams in the roofing (under shingles, past lapped seams in metal roofs, etc. ), and can then flow through the underlayment into living spaces or more typically through the soffit. 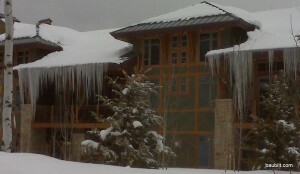 A telltale sign of ice damming is brown icicles hanging from the underside of the roof, indicating water flowed through the roof and down through the soffit. 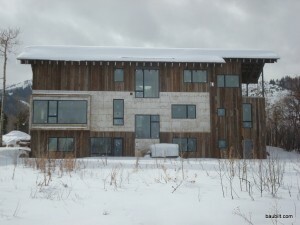 Buildingscience.com has an outstanding digest detailing exactly how ice dams are formed and strategies for addressing them. To reiterate, ice dams require: (1) snow on the roof, (2) melting of snow on an upper surface of the roof, and (3) re-freezing of the melt water near the eaves. At the end of this post, I’ll give some nerdy details on melt rates and insulation. Here are some highlights. Snow on the roof is required because otherwise there isn’t a source of water. (There is also a more subtle reason that snow is a cause of ice damming, explained shortly.) However, notice that this roof, photographed on the same day and located right nearby, has no icicles. Why not? Roof of unfinished house. Notice there are no icicles. This roof is on an unfinished house open to the elements. This means that the surface of the roof is basically at ambient temperature, on this day about 25F. The roof is completely covered by snow and the whole system of snow and roof is at 25F. There is no melting and thus no ice damming. There must be melting on an upper surface of the roof for there to be ice damming. These two examples are evidence of the most significant contributing factor to ice damming: warming of the roof surface from the inside of the building. In the new building shown in the top photo, heat is flowing from the inside of the building through the roof assembly and causing melting at the roof surface. In the unfinished structure, where the inside is 25F, there is no heat flow and no melting. Thus, no ice damming. There is one other way that snow can melt on an upper surface of the roof, which is pretty much unavoidable. If there is a bare patch of roof near the ridge, often exposed by wind, then solar radiation can raise the surface of the roof above freezing, even on a cold day, and there will be some melting at the edge of the bare spot, which will run down the roof surface under the remaining snow. This approach works for conventionally built attic/roof systems, but my house has cathedral ceilings everywhere. No attic. So, what do I do? My roof system is framed with 2×12 rafters. The standard approach is to ensure that there is a 1-2″ air space under the roof surface in each rafter bay and to vent those rafter bays at the eaves. There are plastic “trays” that can be stapled up into the rafter bays to ensure this air gap is preserved. The idea is to ensure that the underside of the roof (the 1-2″ gap between insulation and the roof decking) is close to ambient temperature. But, honestly, this has always struck me as a dodgy strategy. First, how can you be sure those channels stay open? What about the heat transfer through the rafters? Do those eave vents really allow enough air flow? What about the warm air that will inevitably get by the poorly installed insulation and ceiling penetrations? Another approach is to super-insulate the cathedral ceiling, usually with spray foam or a combination of spray foam and fiberglass batts. After all, if I have R60 in my roof, can the roof surface really ever get warm enough to melt snow? Sure it can. In fact, you can be certain that your roof surface will be at exactly 32F even if you are superinsulating. Snow is a pretty good insulator, R1 per inch. So, if you have 48 inches of snow on your roof (not unusual for my site) then you have R48 on top of your roof. Let’s say you have R48 below your roof. That implies that the temperature at your roof surface (ignoring melting for a moment) will be exactly halfway between the temperature outside and the temperature inside. If the outside air is 25F and the inside of your house is 70F, then your roof surface by this logic would be 47.5F. Yikes, that’s warm enough to melt snow. Recall that water melts at exactly 32F. (Note to non-US readers: sorry for the imperial units. They are just so standard in U.S. construction that I don’t dare use S.I.) Snow can not exist at 47.5F. So, your roof surface never gets above 32F as long as it has snow on it. 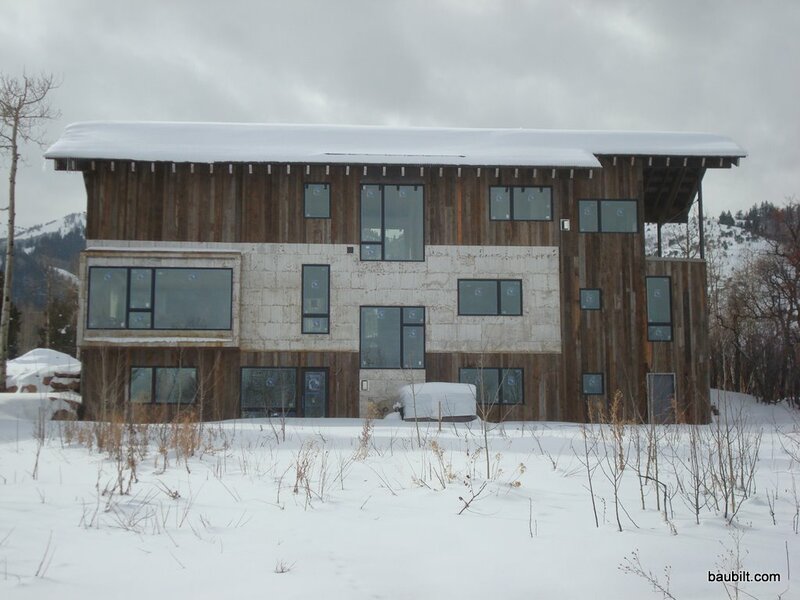 Rather, the inside of your house transfers heat to the roof surface where it melts snow and stays at exactly 32F. But, a steady stream of water drips down the roof surface corresponding to the amount of heat transfered from the house to the melting process. Two important points: First, while 3 cups per day per linear foot of eave may not sound like much, it is a deluge if the roof shape funnels water down into a narrow valley. Valleys in roofs should be avoided at all costs in snow country. I have none. Repeat, none. Note how the roof in the top photo funnels melting from adjacent roof surfaces down to the lower eave. If you have lots of eave length and relatively little roof above the eaves you minimize the ice at the eaves. Second, over a few weeks, 3 cups per day is a problem in my opinion. Even a super-insulated cathedral ceiling concerns me. My architects have built lots of superinsulated unvented cathedral ceilings without incident. Buildingscience.com claims super-insulated unvented cathedral ceilings can work fine. Still, I am a belt-and-suspenders kind of guy when it comes to ice dams. Here is an illustration of the design of my roof system. 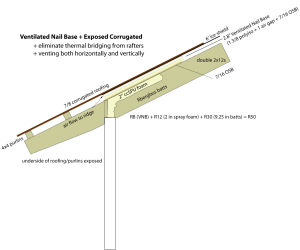 Section of roof system. Corrugated roofing over ice shield over ventilated nail base panel over OSB over 2in spray foam over 9 1/4in fiberglass batts. I decided to super-insulate the cathedral ceiling and to use ventilated nail base (VNB) on the roof surface. VNB is sometimes called by the trade-name Cool-Vent, although there are many manufacturers. In fact, I believe most SIP (structural insulated panel) suppliers make VNB. In short, VNB is rigid foam (usually polyisocyanurate) laminated to OSB (oriented strand board) with wood spacers creating a 1-1.5 inch air gap between the foam and the OSB. The panels are installed over the roof decking with long screws, which both adds an insulating layer and allows for the free flow of air in all directions under the roofing. If installed properly, VNB ensures that ambient air flows freely from the eaves to the ridge (and laterally as well). This free flow of air removes the small amount of heat transfered through the insulated ceiling before it can melt any snow. This, of course, is just a foolproof way of achieving what a properly vented conventional rafter system is intended to do. There are other ways of achieving a “cold roof” including furring out a second layer of roof decking. However, I like the VNB product because it eliminates a key cause of ice dams and it adds a layer of insulation, preventing thermal bridging from the roof framing. A couple of manufacturers are Hunter Panels/Cool-Vent and RMax. 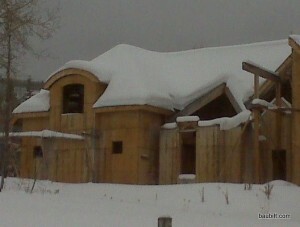 Here’s the house after the first bit of snow in December 2010. No evidence of any melting over the house. There are a few small icicles on the very corners of the roof, but this is because of the sun melting snow at the edges of the metal roof. Ironically, on a warm day you get some melting on the area of the roof above the eaves (but not over the house) because of the warm air heating the metal roof from below. Since my roof is 13 ft from the heated edge of the house to the ridge, each linear foot of eave has 13 sq-ft of roof area above it, so I would expect melting of 13 x 0.0047 = 0.061 lb/hr or 1.47 lb/day at the eave. That’s about 3 cups of water per linear foot of eave per day. Ahah, I had a minor epiphany reading this. I’d been wondering for a while why many west coast of Scotland houses have no or very short eves. Of course, many are very poorly insulated, or were when they were originally built, so the roves tend to be warm. Though the temperatures don’t generally get very low on the coast (“Gulf Stream”, etc) they can be below freezing for a longish while during which quite a lot of snow may be dumped. If there were long exposed eves then they’d be a lot colder and susceptible to ice damming. Eves are there to give shade from the sun but that’s not generally much of a problem in Scotland and to protect the wall from rain but that tends to arrive pretty much horizontally there anyway.